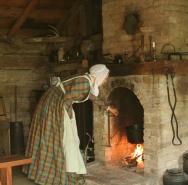 Spend a day in the 19th century at Fanshawe Pioneer Village! The past comes alive through daily demonstrations of trades, farming practices, domestic chores and social pastimes by costumed interpreters. Drop by the Denfield General Store for unique, hand crafted gifts and plan to stay for lunch at the Pioneer Village Café, featuring homemade soups, salads and breads. Don’t forget fresh made pies or butter tarts for dessert!